and if you win, it’s yours! 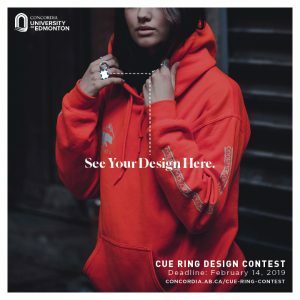 CUE’s Alumni Relations Office is hosting an exciting contest that could see your ring design on the hands of people all over Concordia University of Edmonton and beyond! Your own ring! We’ll have professional jewellers make the ring for you as your prize. And, your ring design will be available for purchase by the CUE community starting in April, with pre-order sales beginning mid-March. Anyone over the age of 18 who has a connection with CUE, including: a member of faculty, staff, current student, alumni, community ensemble members, audience members, or board members. The winner will be announced on Monday, March 4, 2019.